19 Queens offers privacy and panoramic sea views over Oneroa Bay. Centrally located and beautifully presented, 19 Queens offers privacy and panoramic sea views over Oneroa Bay and beyond. 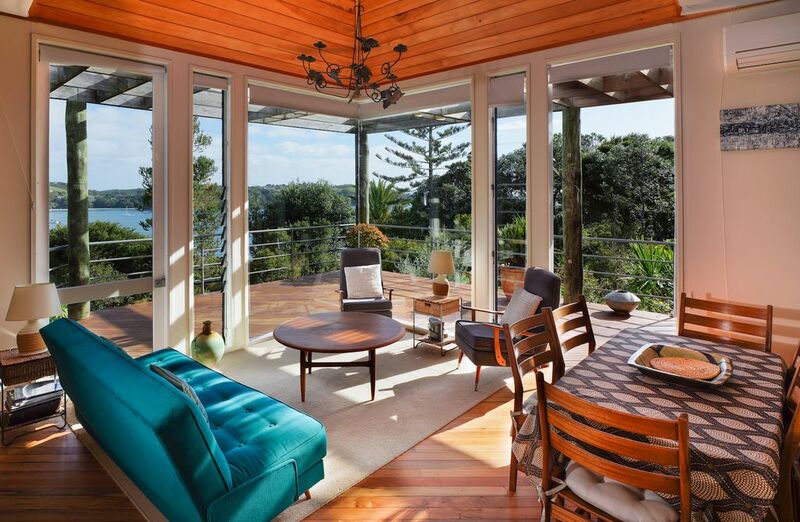 We love the 50's inspired decor and lovely artwork at this comfortable Waiheke Island bach. The living/dining area is open plan with floor to ceiling glass opening the house to the views and large deck where guests can BBQ, enjoy a meal and take in the simply stunning sunsets. The kitchen is spacious and fully equipped for meal preparations. The house will comfortably sleep four in two bedrooms. 19 Queens is located in Oneroa and a short 7 minute walk via a walking track to Little Oneroa beach. There is a fantastic playground/BBQ area at "Little O" as well as a dairy and fish and chip shop. The main village of Oneroa with many cafes, shops and galleries is a 15 minute walk or short drive from the property. Waiheke Island is known for its stunning beaches, amazing coastal walkways and world class vineyards and restaurants. 19 Queens is a great base to explore the island, relax and forget the world! Please note: Parking for the property is off street and there is a track (100 steps) to the house from the road. A lovely looking house, with a great view and garden. A lovely looking house, with a great view and garden. We enjoyed the privacy of the deck and the bush surrounding us. Louvre windows kept the house cool, even with floor to ceiling windows and all day sun. A nice bathroom, comfy beds and well equipped kitchen. The house is secure.